So in the midst of getting the shop up and running, yeah still not done…. 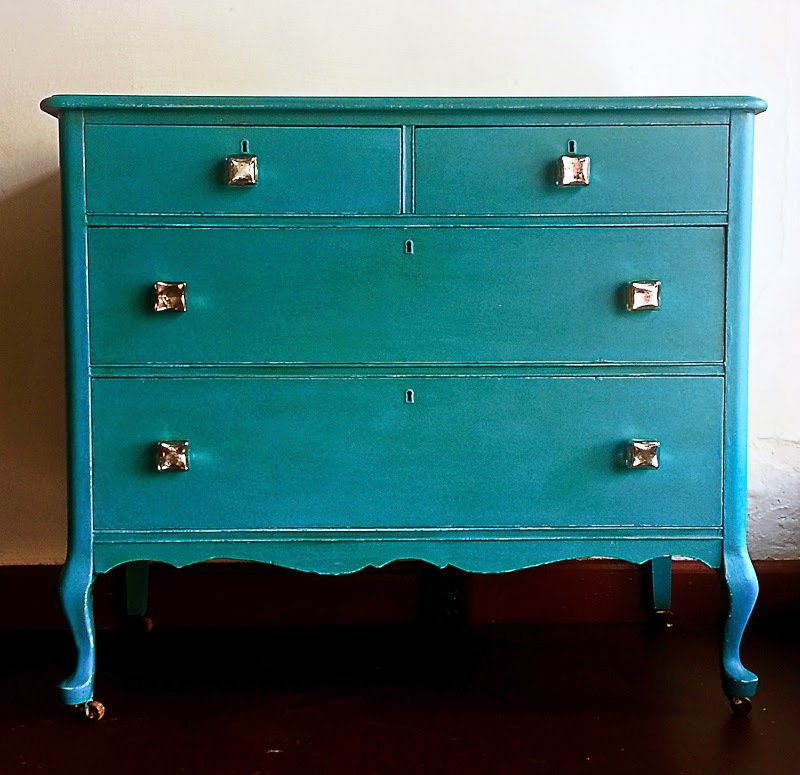 I got an email from a local girl who wanted her dresser painted. Since I now have rent to pay I of course said of course! 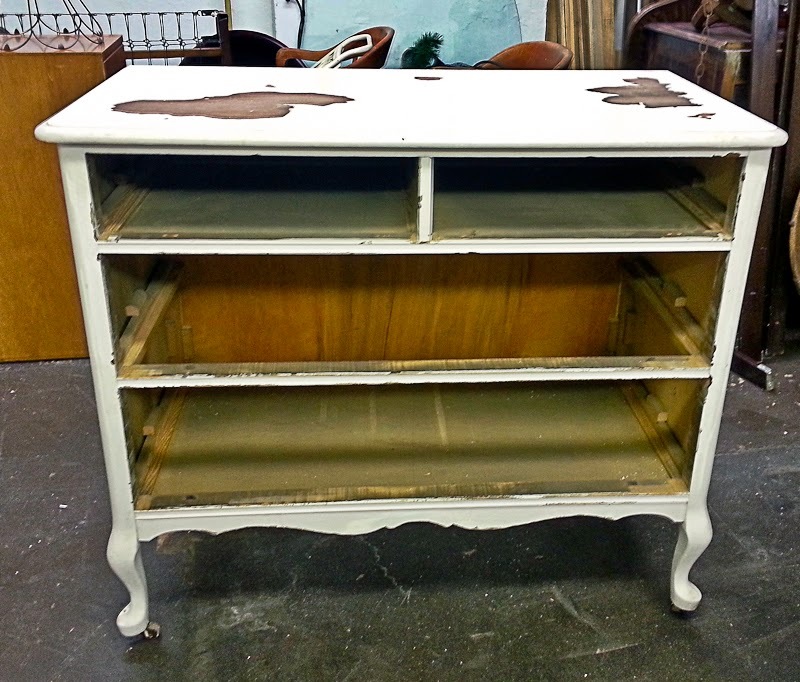 She had grabbed it from the neighbor's trash and it had been "makeover" before with some really thick white paint, a bad brush, and some even worse hardware. 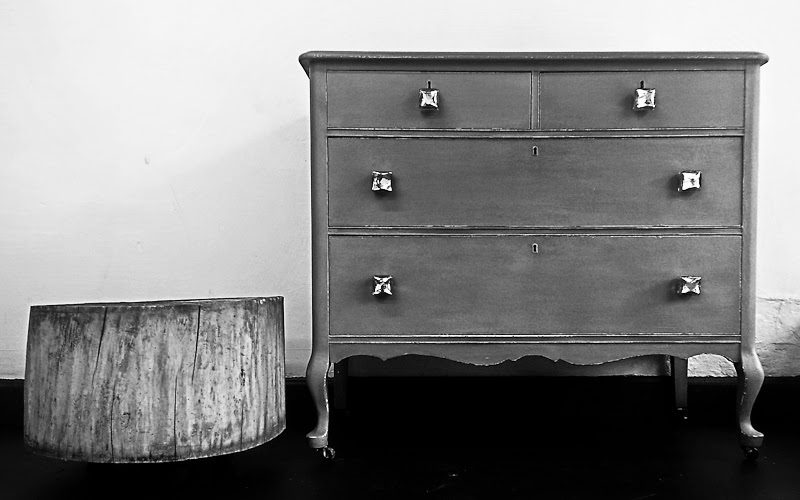 But I am glad that Sarah could see the potential because is still had its original casters and the dresser was very sturdy. 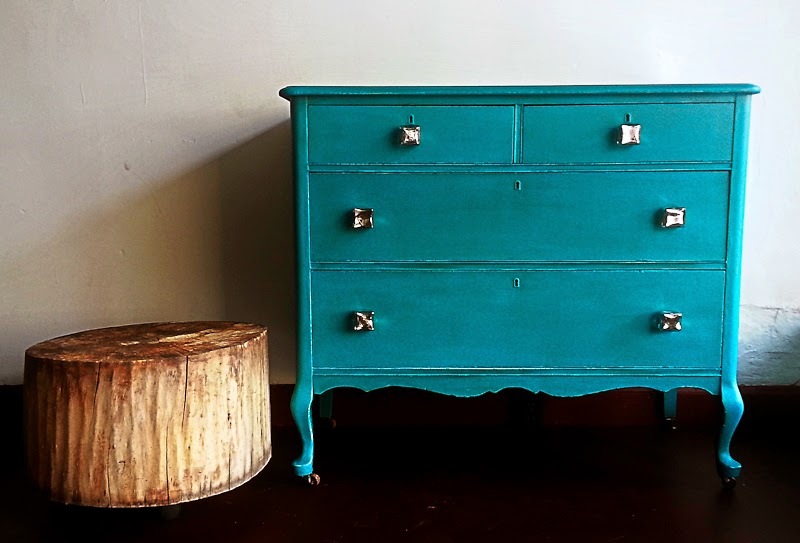 She picked a beautiful turquoisy teal color called Island Dream from Behr. I had to use Bondo, an automotive epoxy to fill in the missing paint since they had really piled it on thick. You could see all of the brush strokes and wood filler does not do a good job in these kinds of situations where there is an actual ledge where the paint meets the wood. Because I had such large patches to fill in a used a little less accelerator than I normally do so I had a bit more working time. I needed to get the Bondo all on and then have time to smooth it out using my wide scraper. It sands so nice and filled in some other deep dings as well. Once I gave the whole thing a really good sanding, then it was time to get to work on the drawers. 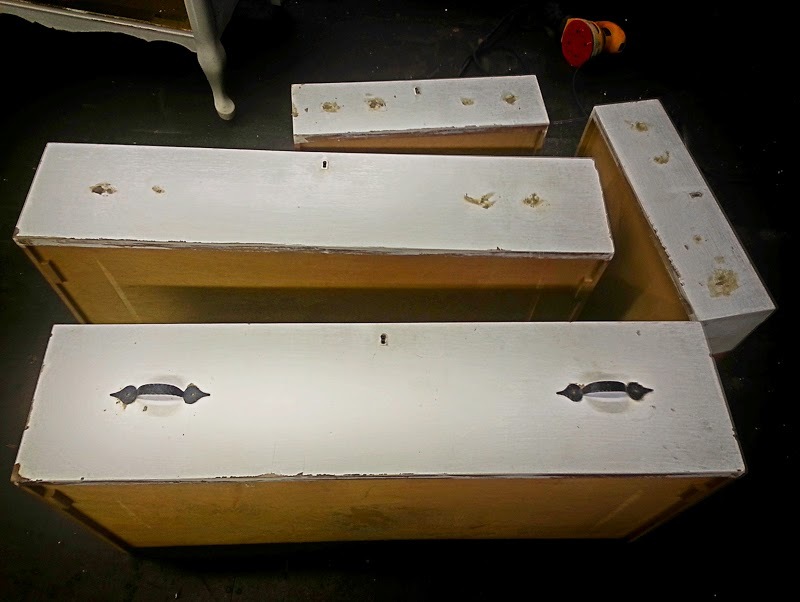 Because Sarah had chosen single pulls for the drawers, I filled in all the holes with wood filler and once dry, gave the holes a layer of the Bondo since there were heavy gouges around the holes where the previous hardware had been. Then these too got a good sanding and we are ready to paint! Want to see what Island Dream looks like?? I'd say it looks pretty dreamy! Love the mercury glass knobs from Hobby Lobby. 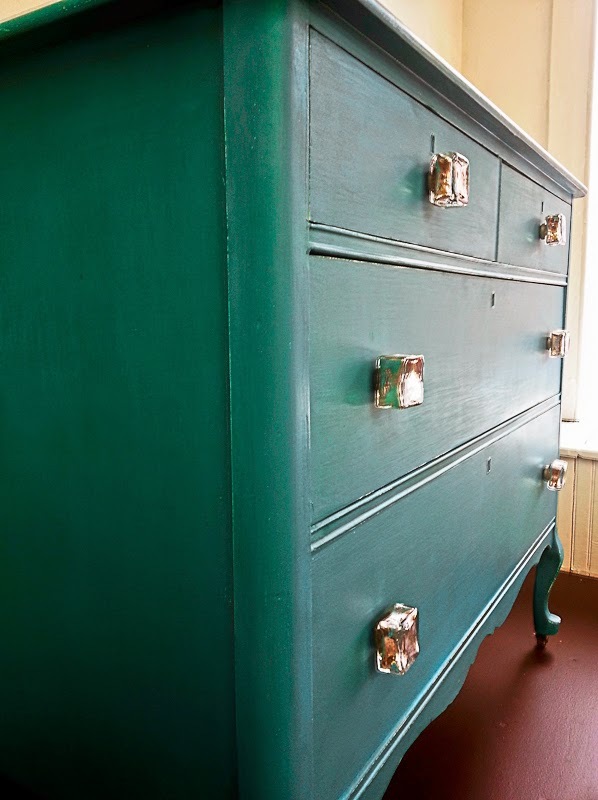 When I first painted the dresser and drawers, I liked the color but it looked a little flat. The left is the original and the right is with stain. Even with the distressing, I wasn't thrilled. So I used Dark Walnut stain from Minwax on one of the drawers and texted Sarah a photo to see if she liked it. I figured if she didn't, one drawer wasn't too bad to paint all over again. She loved it and so the rest of it got stained as well. 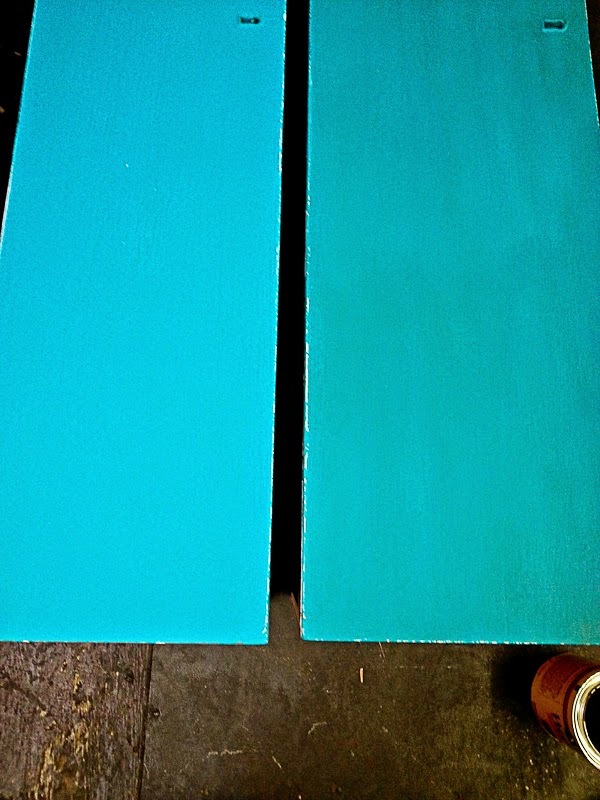 Stain just changes the color subtly but gives your paint color more depth. I have absolutely no props down at the shop yet except so I had to use my tree stump for "ambiance". I think it is kind of dreamy. If you want to stay more updated on the progress of the shop, follow my Instagram feed since I am way more on top of that than the blog right now! oooh kim! that is sooooo pretty! love that fun color!